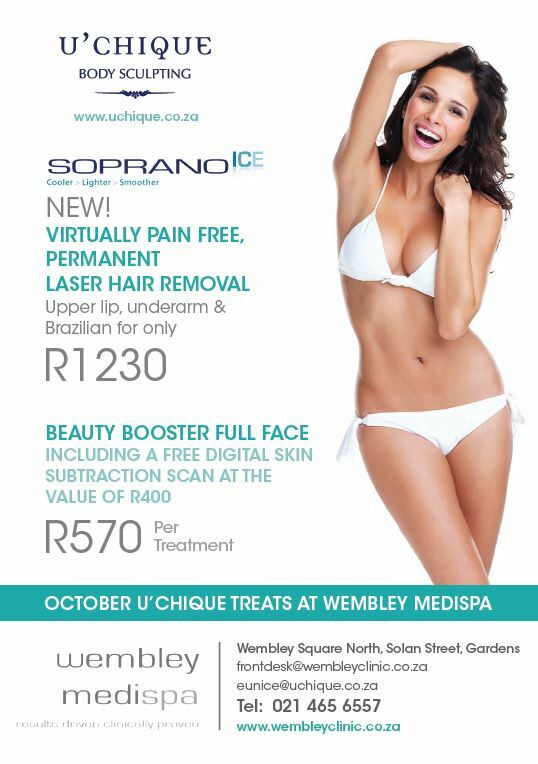 The Wembley MediSpa Exciting October promotion! Results will be visible after the first treatment and hair shedding of the active hair will start between 5 days and 3 weeks. What is different about the SopranoICE laser hair removal machine? The complete revolutionary solution for hair removal. The most comfortable hair removal laser in the world. Based on clinically proven SHR technology the SopranoICE can operate at 10 hertz per second, creating one of the fastest treatments in the world. Those receiving the treatment benefit from technology with a lighter hand piece, improved cooling, a larger spot size, a fast coverage rate and the highest quality diode laser (810nm) in the industry. The SopranoICE elevates the already exceptional Soprano platform. No use of aesthetician or numbing gels needed for treatments. SHR and in-motion technology produces extremely effective results with minimum risk. Rather than exposing the hair follicle to a single high energy pulse, which can cause trauma to skin with a high melanin count SHR gradually heats the skin until the required heat energy is delivered to the hair follicles until they can no longer produce new hair. This makes SHR a safe and comfortable laser hair removal option also for darker skin types. The hair cycle is complex and varies form one body location to another. The number of sessions depends also on the skin type and the nature of the hair (Colour and thickness). On the average, one area treatment will require between 6 to 12 sessions. Does it work on all hair colours? Do the Soprano Ice laser hair removal treatments hurt? The most remarkable difference between the Pain-Free, Hair-Free procedure and any other hair removal procedures (including other laser procedures) is the absence of pain. SopranoICE in motion technology, along with the DualChill mechanism, ensures your comfort during the treatment. In general the procedure has being likened to a hot stone massage. Duel layer Radio Frequency enhances vasodilation and increases blood flow, allowing for lymphatic drainage to improve oxygen levels that will assist metabolism. This duel layer RF is targeted energy that helps reorganize the cellular environment and stimulates the cells to restructure collagen, improve elasticity, tone, tighten and contour the skin. The results also show a reduction of cellulite and stretch-marks, dark circles, improvement of pigmentation caused by sun damage. In combination, these dual-layer treatments can create dramatic change without the need for invasive surgery. Collagen fibres contract and multiply which firms and improve laxity. Circulation improves and retained fluids drain from subcutaneous adipose tissue to reduce edema, erythema and gives overall volume. Fractional laser – Pixel RF that incorporates the Unipolar RF-based technology. Our preferred choice to tighten and lift problematic areas like sagging brows, cheeks, fine lines, acne, striate marks, dark circles, wrinkles and skin resurfacing.